These are "shooting Stars" which occur over several weeks in summer with the peak activity on August 12, one day after the eclipse in 1999. At the Greatest Point (Romania) the best views are by midnight August 12/13 The origin is from comet Swift-Tuttle which returns every 143 years or so, was back a few years ago (1992-93) and gave fantastic meteor rain (but no storm) in summer 1993. The yearly Perseid meteor shower is one of the best of the year, each year, with up to one hundred meteors per hour under ideal observing conditions. 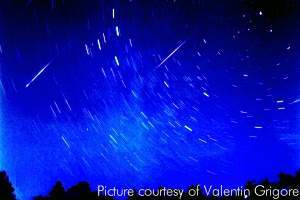 Activity from this meteor shower is visible from about July 23 until August 22. At the time of Maximum on August 12/13 (J2000 solar longitude=139.7 deg), the radiant is located at RA=47 deg, DECL=+57 deg. The hourly rate typically reaches 80, although some years have been as low as 4 and as high as 200. The meteors tend to be very fast, with an average magnitude of 2.3, and about 45% leave persistent trains. The radiant advances by a rate of 1.40 deg/day in RA and 0.25 deg/day in DECL. This is the most famous of all meteor showers. It never fails to provide an impressive display and, due to its summertime appearance, it tends to provide the majority of meteors seen by non-astronomy enthusiasts. Is the Greatest Point of the last total solar eclipse of the Millennium chosen to be as a sign? NOSTRADAMUS: one of the prophecies of Nostradamus mention Romania as a blessed land when the End of the World will come. God will let us know when this time will come by sending us a major heavenly sign. Might this be the 1999 total solar eclipse? BURIDAVA: The greatest point of the eclipse is located a few of meters away from the antique Dacian town Buridava , the native place of Burebista - greatest king of the Daches who challenged Caesar 2,000 years ago. They were both assassinated. Some people say that Romanians have no history but a significant proto history starting 3,000 years before the known antique civilization denies this statement. Will the circle be closed? THE CLASH OF CIVILIZATIONS: Samuel P. Huntington wrote on his 'The Clash of Civilization and the Remaking of World Order' that one of the worlds crisis will involve the Occident ( Western Christianism ) and the Ortodoxism. Ocnele Mari is one of the most important and old ecclesiastic town in Charpathians located close to the area usually called Europe or Western Europe. The Romanian people was a Christian one from the very beginning just like the Latins, Egyptians, Armenian etc. were. They were not baptized at a certain moment by a certain church like Saxons, Russian, Hungarian, etc. They have lived like a forgotten island. The peak seems to be in the eye of the storm. COSOTA: The peak has a slope on one side, called Cosota meaning ' the place for graves' or 'the place for the last stop'. An other sign? 130 km to the third building in the world, The House of Parliament (former Ceusescu's Palace). These are only a few among hundred oh historical sights offered to the discovering travelers. In addition, lets not forget the natural wonders, thepeople to people experiences, arts and craft, walking, biking, tracking and rich touristic sights all of which makes Romania a must in any real "voyageur"'s travel calendar. We hope that visiting our site will induce you to come to Romania. We can assure you that the Romanian will make your visit a worthwile experience that will remain for ever in your travel memory. The data and the suppositions presented are the personal responsibility of the authors. For any quotation the source will be presented. . All information is current as of insertion time. The publisher can not and does not guarantee the accuracy of all information and will not be responsible for errors, changes or omission. Any reproduction without written permission is prohibited if not stated otherwise.